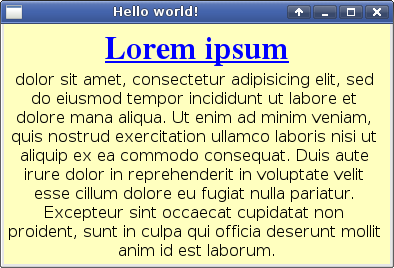 This example follows up on the “hello world” program. It uses a create_label() overload to create a label that word-wraps its text to the given width. A word-wrapping label gets created by setting x::w::label_config's widthmm value. "dolor sit amet, consectetur adipisicing elit, "
"sed do eiusmod tempor incididunt ut labore et dolore mana "
"aliqua. Ut enim ad minim veniam, quis nostrud exercitation "
"ullamco laboris nisi ut aliquip ex ea commodo consequat. " "Duis aute irure dolor in reprehenderit in voluptate velit "
"esse cillum dolore eu fugiat nulla pariatur. " "Excepteur sint occaecat cupidatat non proident, "
"sunt in culpa qui officia deserunt mollit anim id est "
// Configuration filename where we save the window's position. // Load the saved window position. // happens if the file does not exist. // identifies the stored position. // show()n) in its former position and size (hopefully). // configuration file does not exist). // to main_window's constructor specifies optional main window settings. // thread can access it at any time. // modify() and passing it a closure, or a callable object. // as its parameter. The closure can then modify its members. // again, can replace the original config.appearance. // replaces the existing saved position with the same label. // Multiple main_windows must have a unique label, each. x::w::main_window creator lambda is factored out, in this example, into a separate function, for clarity. Setting background_color in the x::w::main_window_config and using it to create the main window (see the section called “Preserving window positions” for more information) with create_mainwindow() sets the main window's background to light yellow, then just like helloworld.C it uses the main window's grid layout manager to create_label() inside it. A word-wrapped label gets created by setting widthmm. This sets the width of the label in millimeters, and not pixels. The estimated width gets scaled by the display screen's resolution automatically, to compute the targeted width in pixels. Furthermore, the eventual width of the word-wrapped label may differ, because its container's layout manager may end up adjusting its width based on other display elements in the containjer. Newline characters create multi-line text in a regular, unsized, label. Specifying an estimated width essentially turns the newline characters into paragraph breaks, and the label gets word-wrapped. The estimated width parameter sets the initial text label width, in most cases; but this is only a suggestion. The label automatically adjusts the width of the word-wrapped text to fit whatever space is available. When a window has other elements the grid layout manager typically computes the width of the label's columns based on other display elements' requirements. The label then adjusts its width accordingly. The above example does not create any other display elements, so the window does not have any other requirements. The resulting window's width becomes resizable. The window's width can be increased or decreased. The text flows to fit the window's width; in turn adjusting the window's height as well. Setting alignment together with widthmm sets the horizontal alignment of each line. If not specified the text is shown left-aligned, normally. An x::w::rgb parameter sets the color for the following text. A second x::w::rgb parameter in a row sets the text's background color. The rgb.H header file defines standard HTML 3.2 colors as x::w::rgbs, for convenience. An x::w::font parameter sets the font for the following text. #include <x/w/font_literals.H> enables "description"_font decorators. #include <x/w/text_param_literals.H> enables "description"_theme_font decorators. Running wordwraplabel.C again should open its window in the same position where it was previously, This stickiness needs some additional coding, and the actual behavior can vary depending upon the display screen's window manager, the ultimate judge where new windows open and how big they are. x::w::main_window's save() gets called before the program ends. This records the window's last known position on the screen in the x::w::screen_positions. More than one window's position may be recorded, and a unique label identifies each window with a recorded position. Each main window that gets created by the application (if there's more than one) needs a unique identifying label which serves as the window's identifier. After recording each window's positions, x::w::screen_positions's save() saves all positions in a file. This example program uses LibCXX's base library's x::configdir function to initialize a configuration directory for wordwraplabel's use, where the window's position get saved. Specifying a filename when create() a new x::w::screen_positions object. This reads the previously saved positions from the file, if the file exists. The x::w::main_window_config objects is a helper object that sets optional main window settings. It gets constructed before the main window gets created, and its restore() method specifies and the application-assigned label for the new main window, and the loaded x::w::screen_positions object. The x::w::main_window_config parameter gets passed to the overloaded main window create()or. If the window had any save()d containers or display elements they have to be individually restored, as they get constructed by the creator lambda. All memorizable containers and display elements get automatically save()d together with their main window; but they need individual restoration. The named window's position that was saved the last time wordwraplabel ran, that same position and size gets set for the new window. The same label gets used to record the window's position, by its save() method. It's possible that application windows still open in their last known position even without explicitly saving them this way. Some window managers try to remember application windows, and open them in the same location. It's also possible that an application's requested window position gets ignored by the window manager, and the application window still opens in some other location on the screen.